Connecticut has its hands full these days as the supreme manager of its casino industry. Las Vegas-based MGM Resorts International said Monday at a press conference that it plans to build a new casino in the state, which would be its 17th casino complex in the U.S. The casino operator, one of the largest of its kind in the world, is also in the middle of building a casino in nearby Springfield, Mass. The company wants to build its Connecticut casino in Bridgeport, about 80 miles southwest from Springfield and just a 90-minute train ride from New York City. A few years ago MGM was unsuccessful in lobbying the state of New York to approve a casino for the most populous city in the country, as officials there wanted to use casinos to bolster upstate economies. 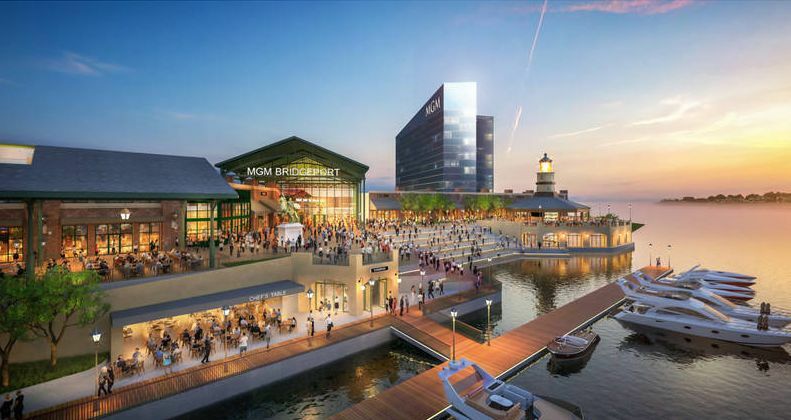 The Bridgeport plan calls for a $675 million waterfront casino, the latest move in a casino chess match against the state’s two tribal gaming groups that have allied with one another. The Mashantucket Pequot and Mohegan tribes, operators of the Foxwoods and Mohegan Sun casinos respectively, in May received state approval to build a jointly-run facility in East Windsor, just 15 miles south of the $950 million MGM Springfield that’s slated to open next year. The East Windsor casino would not be on tribal land, a first for the state. The Springfield project came at a poor time for Connecticut’s casino gambling industry. Foxwoods and Mohegan Sun had their combined gaming revenue fall 7.5 percent between 2013 and 2015 to $1.6 billion, according to Casino City’s 2017 Indian Gaming Industry Report. That’s despite national casino gaming revenue trending upward. The U.S. Northeast has been home to a mad dash of casino construction in the years after the Great Recession. The Las Vegas gambling market took a nose dive after 2007, and it still hasn’t recovered, leading firms to find investments elsewhere. The new casinos in the northeast have devastated New Jersey’s Atlantic City. The Garden State has flirted with the idea of putting a casino at the Meadowlands sports complex just outside New York City, but for now the focus has been on propping up Atlantic City. With competition for gambling dollars in the region growing steeper and steeper, MGM also made the argument that it legally should have been allowed to compete for the right to build the third Connecticut casino. The argument appeared to fall on mostly deaf ears, as the tribes were given the green light relatively quickly by state lawmakers. The tribes responded to MGM’s announcement by saying that the casino in Bridgeport would run afoul of the tribal-state gaming compacts that give the Native American groups the exclusive right to offer Las Vegas-style gambling. MGM would need to obtain state and local approval to move forward with the project, and it’s not yet clear if it could do so. The tribes will pay Connecticut 25 percent of gaming revenue from the East Windsor casino, but MGM argued that the state won’t reap the benefits of licensing fees that it would pay on a casino it built. The company said the state was getting a poor deal. Of course the tribes disagree.